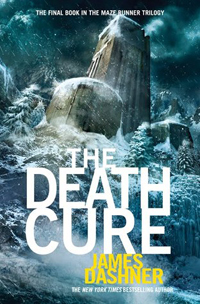 This week the book I'm waiting for is The Death Cure by James Dashner. I love the Maze Runner series, and can't wait to see what the final book has in store. The Maze Runner is an awesome dystopian/sci-fi/thriller YA series that will have you on your toes, and if you haven't picked it up yet, I highly recommend it! You know, I had a really difficult time getting into THE MAZE RUNNER. I can see why it's so popular, I love the idea, and the covers rock, but for some reason it just didn't all add up for me. We're excited about this one too! We snagged the first 50 something pages of this!! I still need to read The Scorch Trials! Too little time! I love Maze Runner movies but I never got to read book series. So now I am really looking forward to reading them. I bet it is going to be awesome and probably even better then the movies. Thank you for posting. When a person wants to write something, one must take this seriously. And it does not matter what you write: story, novel or term paper outline - any paper should be written interestingly for the reader. Otherwise, you can publish another "masterpiece", dusting on the top shelf of the bookstore. The idea is very important. And it is desirable that it was unique. And not taken from a famous author and altered. In general, writing any essay is very useful not only for a professional writer. Even students constantly write different documents in college. Such an article will teach you how to think and clearly articulate your thoughts, defend their views, etc.